The advancement of cloud solutions and technologies has created a transformation in how most companies consume infrastructure services. Today, most of us find ourselves in a hybrid cloud state, consuming compute services in a variety of ways. IaaS, PaaS and SaaS have become everyday words. However, when it comes managing and integrating cloud solutions with internal IT systems and practices, many organizations struggle. Hybrid cloud is the ticket to an ultimate IT experience. Hybrid environments connect on-premise systems to one or more public cloud solutions. What’s so great about that? It sets you up to accelerate IT services, and, in the end, helps you become digitally enabled. Logicalis Hybrid Cloud Solutions are designed to organize and accelerate your cloud adoption initiatives strategically, enabling you to extract maximum value from your existing assets. Our certified experts know the best practices for hybrid cloud architectures and methodologies. We know Azure and AWS. We know DevOps, automation, and orchestration. We also know all the hardware and software that comprises your existing data centers. Most importantly, we know that your business objectives are the focus of every people, process, and technology decision you make. Our services are designed to make sure your cloud decisions are aligned to meet your business needs. 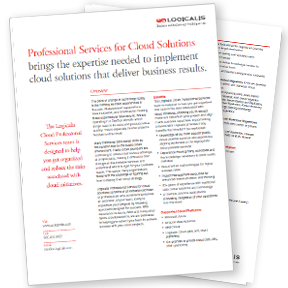 Logicalis Professional Service for cloud solutions consists of an experienced team of professionals who consider themselves an extension of your team, ready to implement your projects by following a process designed for success. Download this datasheet to learn more.